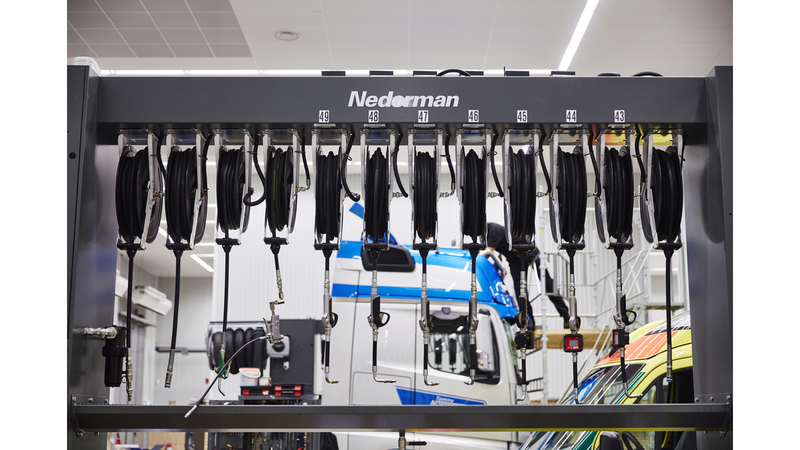 Nederman has developed and manufactured high quality, retractable hose and cable reels for more than 70 years. Our hose and cable reels are used all around the world and can be found in every type of industry. The reels provide highly efficient, easy-to-use and economical solutions for cable management in a wide variety of applications. All Nederman retractable reels are simple to operate and safe to use. Most of our reels are fitted with ball bearings in the drum and swivel shaft, which makes pulling and retracting the cable or hose easy. High quality seals minimize any risk of leakage. All of our reels have optimized spring force, ensuring that the hose or cable retracts smoothly and evenly onto the drum. The high quality spring is pre-tensioned at the factory to suit a wide range of applications, and is protected inside the drum cavity. Our retractable reels are very easy to mount, either on walls, ceilings or floors. We have the market’s widest range of products and systems, as well as extensive experience and knowledge in how to build the optimal solution.